Jackson Hole Golf Club Hole 2: This hole seems fairly mundane for the first two shots, but from a wedge distance or so, the player can see the creek in front of the green and the lake to its right. As the green is not that large, the suggestion is to leave a short iron to maximize accuracy. Jackson Hole Golf Club Hole 3: From the tee, once can see that all is not well short and left (the hole is slightly uphill, obscuring vision), but once the player gets to the green, the visibility gets more clear and the perilous nature of the tee shot becomes more evident as any pin placement short or left will be right on top of the water hazard. Jackson Hole Golf Club Hole 4: This fairly long, straight par four culminates around the massive trees on the other side of the fairway. Any tee shot that is wayward will certainly have to be shaped around those. The two large fronting bunkers also make punch up shots pretty difficult, so the drive is key. 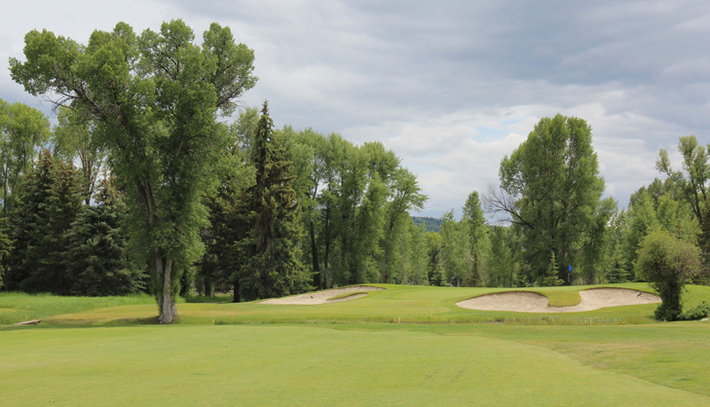 Jackson Hole Golf Club Hole 5: This dogleg left par four is best played with a tee shot left-center as anything too far right will leave a longer shot to a well-bunkered green. Going too far left, however, will be in the fairway bunkers, or blocked by some trees on that side of the hole. 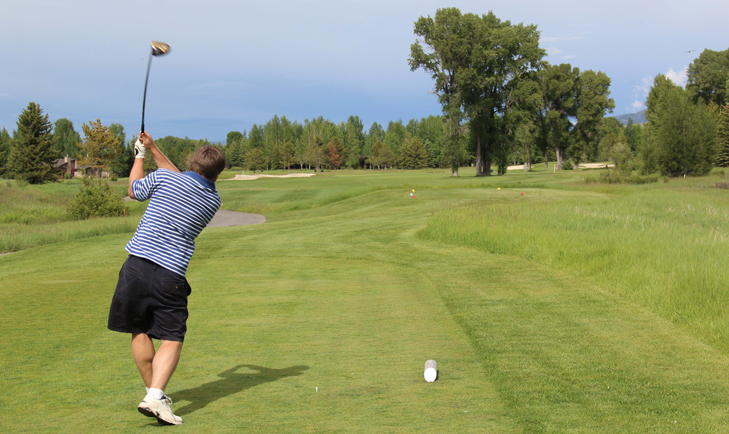 Jackson Hole Golf Club Hole 8: This tough, long, dogleg right par five is filled with angles and choices about how much to bite off with each shot. The green itself is over a little creek and well-bunkered, but the golfer needs to be on their toes from tee to green on this hole. 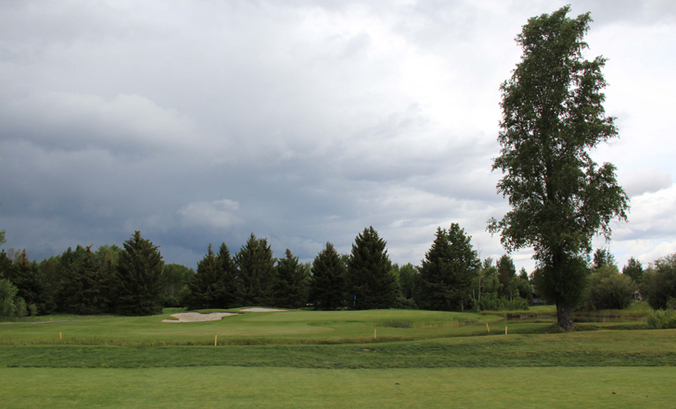 Jackson Hole Golf Club Hole 9: The finishing hole to the front nine is long, straight and tight. There is OB to the right and large trees waiting to gobble up errant shots. The green has a heavy slope to it as well. 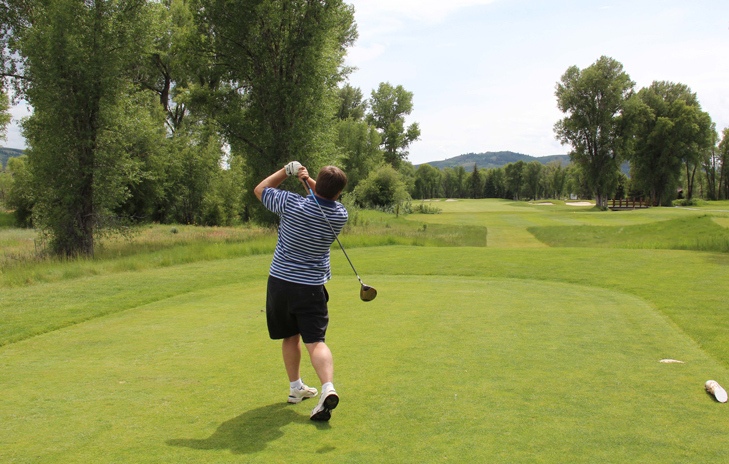 Jackson Hole Golf Club Hole 10: The start to the back nine is a tight, tree-lined, slight dogleg right par four. The green is guarded by a very large bunker to the left side and another to the right. Jackson Hole Golf Club Hole 11: This exciting dogleg par five is really unique in a couple of ways. 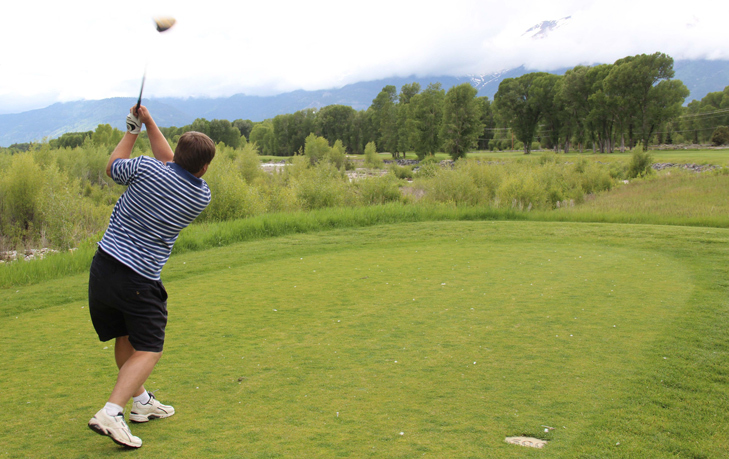 First, from tee to green, it gives the player the opportunity to avoid the Snake River. Secondly, the aggressive tee shot needs to cut the corner and negotiate its way around or over the trees left of the fairway. The whole is much easier when played as a three-shotter, but a long approach to the huge green on the banks of the river is no bargain. The green is large and back-left pin placements provide extra challenge. Jackson Hole Golf Club Hole 12: The only short par four on the back nine has a strategic drive that needs to avoid the trees and the bunkers on this tight hole. From there, the approach from the fairway should yield birdie putts. 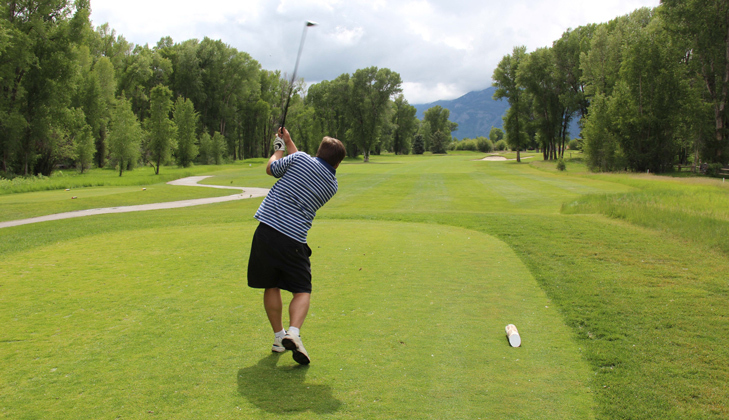 Jackson Hole Golf Club Hole 13: The signature hole has a backdrop of the most famous section of the Grand Teton range. It also has a lake front and another one hidden from view behind and right of the green. Jackson Hole Golf Club Hole 14: This long par four has a lot of trouble to the right off the tee, in the form of trees and a water hazard. However, right center is a great angle to the green and leaves a shorter approach. Jackson Hole Golf Club Hole 16: The final par three is surrounded by bunkers and, once again, features a great backdrop of the Grand Teton mountain range.